Scott Technology Park is northeastern Pennsylvania’s premier technology campus conveniently located one-mile from Interstate 81. Fully served by underground utilities, Scott Technology Park offers industrial and office sites ranging from 2-29 acres, which can be combined to create a larger site. With Keystone Opportunity Zone designation, park tenants may enjoy Pennsylvania state and local tax exemption through 2024. 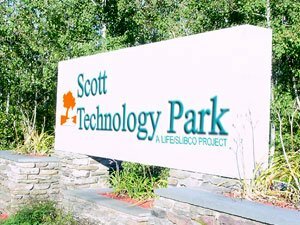 A Scott Technology Park location puts tenants close to the major venture capital markets of the East Coast. The Scranton Lackawanna Industrial Building Company (SLIBCO), the park’s owner, will offer incentives to developers interested in developing speculative buildings within the park. Park Tenants include Process Technologies, Calvert Labs, Automotive Distributing Company and Concrete Countertop Solutions. PPL Electric Utilities provides primary service to Scott Technology Park via an underground 12 KV, 3 Phase, 60-Cycle distribution systems. UGI provides gas service to the entire park. Service to Phase I is supplied by an 8” high pressure gas main and a 6” intermediate gas main. There is also a regulator station in Phase I of the park. Phase II of Scott Technology Park is supplied via a 6” distribution main. Sites within the park are served via 8” mains, with 6” sewer laterals serving each lot. The Lackawanna River Basin Sewer Authority treats the effluent. Telecommunications service is provided by Verizon and Frontier Communications. In addition wireless telecommunication service via the Lackawanna County Wireless Initiative can be made available. PA American Water Company services the park via a 12” main with 8” laterals to each site.